Serlin Consulting specializes in Medical Hypnotherapy, which can alleviate symptoms from many health-related conditions and provide benefits both before and after surgeries. During the 1940’s, John Elliotson, the revered Professor of Practical Medicine at University College, London, and his protégé James Esdaile, a medical officer for the British East India Company, each reported a large number of surgeries performed painlessly,with hypnotism, or the mesmeric trance, as the only anesthetic agent. At a time when surgical mortality was about 40%, Esdaile’s death rate was reduced to only about 5%--an objective outcome that he attributed to the successful relief of pain with hypnotism! Read what others have experienced after Suzanne Serlin worked with them prior to their surgery. Save money on medical bills! According to a University of California, Davis Medical Center study, patients using relaxation and guided imagery techniques spend 1.5 less days in the hospital. This resulted in a savings in hospitalization cost of well over $1,000 per person! Find Out For Yourself! Call Suzanne today at (480) 912-3618 or Email her. “I had always been skeptical of the work that you do, but since my husband insisted that I meet with you before my knee surgery, I decided to give it a try. Thanks to your expertise, I was extremely pleased to feel very little pain in my healing and the doctor said I healed very quickly. 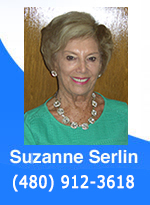 "I have been having trouble with my knee, and I went to Suzanne for a treatment. She worked with me, and through the process, I realized I was clearing out many emotional issues I had been carrying from years ago. By the time we were done, my knee was much better, and has continued to heal. And as a bonus, I am now better able to focus on my goals. I highly recommend Suzanne's treatments to assist you in moving out of stuckness and into mobility." (eliminate spaces around the @ sign).